Susan Bennett, executive director at Spanish Oaks Hospice, could clearly see the pros and cons of her new position when she came to Spanish Oaks Hospice from a larger organization. Founded by the owner of an assisted living facility for Alzheimer’s and dementia patients, Spanish Oaks Hospice prides itself on providing outstanding care for patients at the end of life. The medical director is a gerontologist, and the staff has a special knack for treating dementia and Alzheimer’s patients. However, when she arrived Spanish Oaks had an average census of 30-40 patients and everything was done on paper – “and that was a lot of paper,” Bennett stressed. Assessment forms were six pages, front and back. It took 10 pages to do documentation. While Bennett simplified several processes, she knew that in order to grow, Spanish Oaks needed to move to a computer-based system. Bennett’s experience in her prior job had vividly illustrated the shortcomings of traditional server-based software: equipment, IT personnel costs, and continually dealing with updates and downtime. “It seemed like there was always a problem with something,” she said. The advantages of a cloud-based system were obvious. After shopping around, Bennett found a few systems she liked – then she eliminated the ones that were actually hosted versions of older generation technology. “We wanted a system that was actually developed to be a true web solution,” she said. She chose the Brightree Hospice software solution primarily for the point-of-care functionality and its cloud-based architecture. 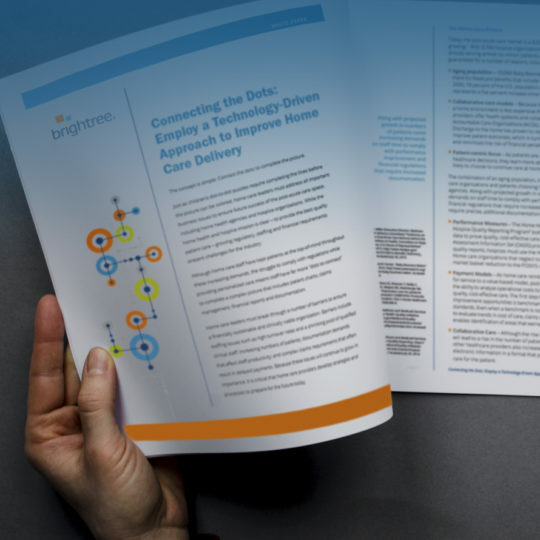 Implementation of the Brightree hospice software solution was simple, and after a few months the benefits were obvious in all areas of operation. Bennett reflected, “The new system streamlined our processes significantly, from admissions to care delivery, all the way through to billing. No more hauling around huge notebooks. No more crossing out and initialing changes, rewriting care plans, or waiting around for someone to make a copy.”. Before the move to Brightree, the Spanish Oaks staff spent hours each week in an “on call” meeting preparing for the weekend. “I figure we save 3-4 hours a week times 14 nurses,” exclaimed Bennett. The time savings didn’t end there. Since Bennett’s arrival Spanish Oaks has seen its census quadruple and now has plans to start construction on their first hospice facility. “Brightree has been a great partner and we are pleased with the attention they have given to all the unique requirements of running a hospice organization,” said Bennett. For their new in-patient facility, they use the shift note functionality in Brightree. Each shift can be closed and visit notes produced at the push of a button. The notes document every encounter during the shift in chronological order, providing the next shift a quick and complete picture of the patient population.